Add SHPE OC Events to your calendar! Are you doing your best in your interviews and falling short of obtaining a job offer? Are you interested in helping others learn tips to improve their resume writing and interviewing skills? 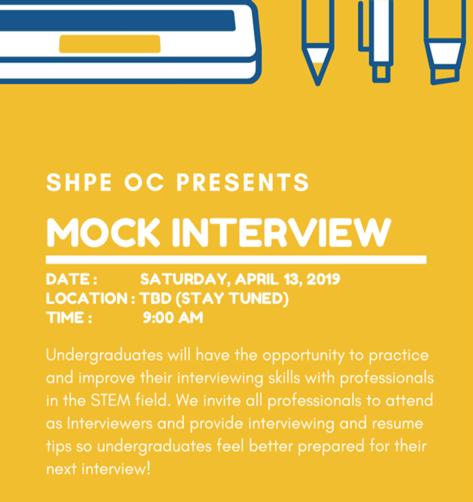 Stop by the Mock Interview session held by SHPE OC to assist undergraduate students in preparing them for any interviews their way. Professionals will be interviewers and provide interviewing and resume tips to better prepare students for their next interview. ​Location: UCI Student Center, Newport Beach A & B For Any questions contact Luis Martinez at martinl2@uci.edu or (323) 373-5658. S.O.N.R.I.E is having their Orphanage trip this April and are looking for additional volunteers to assist. As usual, spots are reserved on a first-come, first-served basis so make sure to RSVP ASAP. Calling all SHPE Runners!!! Some members from SHPE OC, LA South Bay LA, and the GSFV will be running this year's OC Half Marathon. For some, it'll be a leisurely run; for others, it will take some dedicated training to strive for their best time. Regardless of what running condition you are in, it'll be fun to run together and motivate each other as we train! Join our SHPE team and keep an eye out on a training schedule! All information will be shared on the event page below. We hope you can join us! We will setup some weekend runs and get together for bib pickup carbo load event the day before the race. Interested in giving back to the community? Interested in running small STEM activities? Come on out to Century High School to assist the SHPE Jr. Chapter and SHPE UCI in hosting STEM workshops and activities to inspire the next generation of STEM students. California State University, Fullerton invites you to our 1st ever Alumni Mixer! Come out and enjoy a mocktail with SHPE/MAES alumni! An opportunity to network and connect as well as reminisce over past friendships, events and moments.